The new Audi TT will have a reconfigurable instrument panel that also displays the car's navigation and infotainment data. 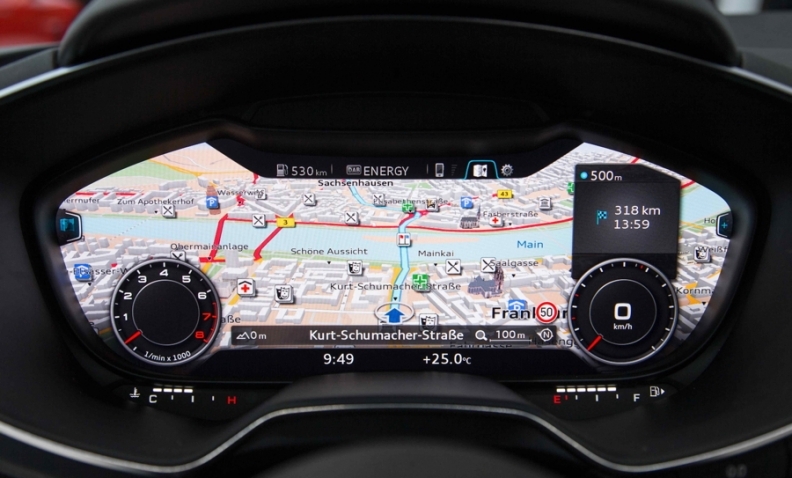 LAS VEGAS, Nevada, USA – The next Audi TT will feature the automaker's virtual cockpit, which is highlighted by a digital instrument panel that displays all the car's information in front of the driver, eliminating the need for a central multimedia interface monitor. Audi previewed the interior planned for the third generation of its iconic coupe at the International Consumer Electronic Show here. The new TT will be unveiled in March at the Geneva auto show and go on sale later this year. The new model will feature a streamlined interior with a reconfigurable 12.3-inche TFT instrument panel that also displays the car's navigation and infotainment data. The solution enables the driver to better experience the car's technology, Audi Chief Technical Officer Ulrich Hackenberg said at press conference at the CES on Jan. 7. "The first Audi TT was the design icon, the second generation was even sportier, and with the new TT the driver will be able to experience the technology to an even greater extent – just as would be expected from a genuine sports car. And it comes with a new generation of electronics and connectivity features," Hackenberg added. The driver can choose from two displays: a classic view with the speedometer and rpm gauge in the foreground and an infotainment mode in which navigation data takes over most of the screen and the car's virtual instrument readings are made smaller. Audi said the solution gave the designers the freedom to slim down the instrument panel and also let them reduced the number of commands housed in the central console. For instance, the controls for the air conditioning system were moved into the central vents. Audi TT coupe will be the first variant of the third-generation car's model line to debut. A roadster version is due before the end of the year followed in 2015 by a third body style, a three-door shooting brake.